Jacobus Johannes Oberholster (known by his friends as Obie) was born on 12 May, 1911 on the farm Noibis in the Karasburg district, South West Africa. As this isolated area lacked schools, he received his first tuition privately and in small schools on neighbouring farms, until he was sent to the Keetmanhoop High School and later Boy's High School in Paarl, where he matriculated in 1931. He studied at Stellenbosch University (BA 1934, MA in History 1935, PhD 1943). Obie was a US Rugby captain and later played for Western Province. After obtaining his Secondary Teachers Diploma in 1936, he was appointed as part time student assistant in the Department of History. In 1938 he was appointed as assistant - registrar at his Alma Mater, but when he was awarded the Webb - bursary for further studies he preferred to join the teaching profession. 1944 -1948: History teacher at schools in Worcester. 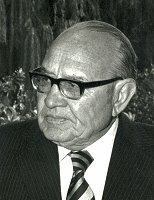 In 1948 he was appointed as senior lecturer in History at the University of the Orange Free State, and professor in 1964. In 1952 he became member of the Historic Monuments Council Commission (later National Monuments Council). In 1976, when he retired from the university, he was appointed as the first Director of the National Monuments Council, a position he held until his death on 13 February, 1980. J J Oberholster was married to Philippina Grobbelaar in 1943. They lived in Bloemfontein, where their two daughters were born, and moved to Stellenbosch in 1976. Die Anneksasie van Griekwaland-Wes, doctoral thesis (supervision by H B Thom, 1943) was republished in 1975.